Frasers Property and the residents of Putney Hill came together recently to celebrate Halloween at the second residents’ Halloween Barbecue. 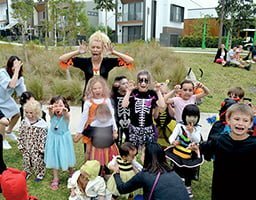 The spooky festivities kicked off in Lardelli Park with residents young and old dressed in their favourite Halloween costumes. It was a great afternoon for residents, both settled and future, to come together and enjoy some great food, drinks and Halloween themed fun. Paul Lowe, Frasers Property Sales & Marketing Director said: “We were delighted to once again host the residents” barbecue in Lardelli Park. The event saw over 200 Putney Hill residents attend along with many members of Frasers Property teams. The jumping castle and star dust entertainers were a massive hit with the kids and the best dressed competition was won by twins Charlotte and Keira Sealey who were dressed as witches. Overall the event was a resounding success and demonstrated the strong sense of community spirit and family friendly atmosphere at Putney Hill, all part of building the quintessential Australian neighbourhood.